Enjoying a great day aboard the FR 450 Rally machine, Pablo Quintanilla has claimed a solid runner-up result on stage three of the Desafio Ruta 40 rally in Argentina. Two stages before the finish of the event in Tucumán, the Rockstar Energy Husqvarna Factory Racing rider is 16 minutes behind a provisional top three final result. Involving demanding navigation and contested in sandy off-piste tracks, today’s special stage was one more challenge towards the finish of this year’s Desafio Ruta 40 rally. Remaining fast and avoiding costly mistakes, Pablo completed the special stage two minutes behind the stage winner. 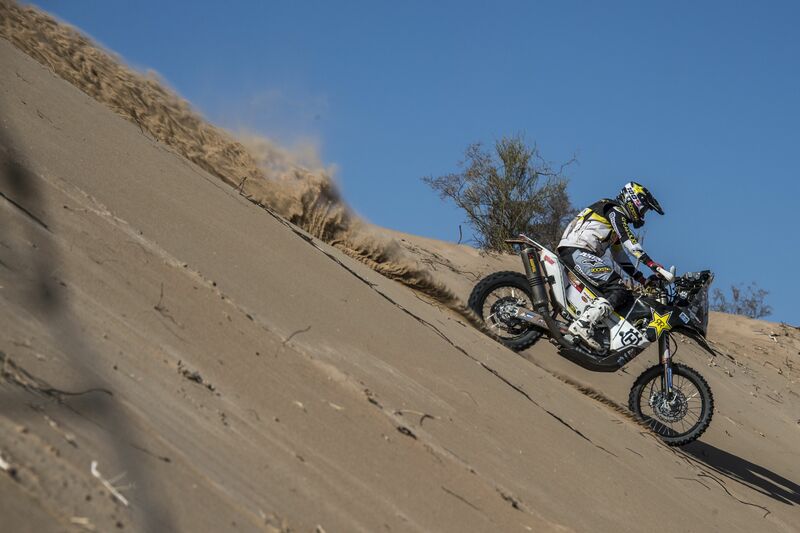 With two stages to go at the 2017 Desafio Ruta 40, the Rockstar Energy Husqvarna Factory Racing Rally star is still in contention for the overall podium. Tomorrow’s stage four of of the Desafio Ruta 40 will take riders further north in Argentina. Starting from Belén competitors will have to complete a total of 535km to reach the finish in Tafí del Valle. The day’s timed special is 309km-long.